Registration will open by Summer 2019! The inaugural Global SOF Foundation (GSF) Modern Warfare Symposium and Expo brought our special operations forces (SOF) community to Ft. Bragg from August 21-23, 2018. We had nearly 450 attendees check in, and over 40% were military or government representatives. Co-sponsored by the U.S. Army Special Operations Forces Command (USASOC), the purpose of this event was to convene subject matter experts, SOF, conventional units, and academia to both educate and connect through discussion about the future of modern warfare from a SOF perspective. This Exhibit-Hall focused event took place in conjunction with the Symposium, and offered 30+ exhibits from companies with capabilities that are needed by Army SOF. 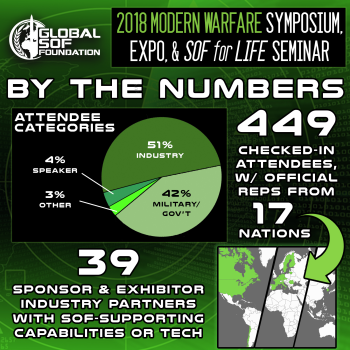 Sign up below and receive updates about the 2019 Global SOF Modern Warfare Symposium & Expo.